Children’s Hospice South West (CHSW) is a registered charity, set up in 1991 to help and support children living with life-limiting conditions and their families. It is the only organisation in the South West to provide hospice, palliative and respite care for children and young people. 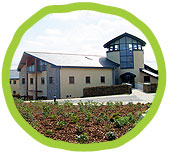 In 1995 Little Bridge House in Devon, the South West’s first children’s hospice, opened to assist families from across the region. It was soon oversubscribed and, in 2007, Charlton Farm was opened in Bristol. And, as a result of the successful Precious Lives Appeal, a third hospice, Little Harbour, was opened in December 2011; it completes a chain of children’s hospices across the region. Little Harbour is set in a spectacular location at Porthpean, overlooking St Austell Bay. Designed and built with a view to celebrating Cornish building traditions and its close proximity to the sea, it has the feel of a ‘holiday home’ in a relaxed seaside setting. As with the other two hospices, there are individual children’s bedrooms, accommodation for parents and siblings, a wide range of play and therapy facilities – including a messy play area, a Jacuzzi and a multi-sensory room – and a family kitchen and living room. The range of services provided includes 24 hour palliative care and end of life care, support for parents, brothers and sisters. The support of the public is vital to this charity and one of the most effective ways of raising awareness, providing support and raising funds is through local Friends’ Groups. The local group is called Friends on the Roseland (FOR CHSW). So, how can you help? No prior experience is necessary and you can be as active (or not) as you wish. Maybe you can make cakes or coffee, find sponsors, organize events, write letters, sell raffle tickets, provide space for a collecting tin, design posters; think creatively – there’s something for everyone! If you would like to get involved or want more information please look at the website www.chsw.org.uk or contact Steve Chapman on 01326 270717 or sparcat@hotmail.com or Sallie Eden on 01326 270469 or sallie_eden@yahoo.co.uk.